Randy Abreu was born and raised in the Bronx, New York to parents from the Dominican Republic. Randy earned his Bachelor’s degree in history and Latin American studies from Skidmore College in 2011 and his J.D. in 2014 from Thomas Jefferson School of Law. While attending Thomas Jefferson, Randy was an honor roll student, director of academics for the Student Bar Association, and member of the Moot Court Honor Society competing in the Phillip C. Jessup International Moot Court Competition. 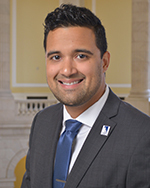 Following his second year of law school, Randy was selected as a Google Policy Fellow and worked as a law clerk for the National Hispanic Media Coalition on various policies, regulations, and legislative issues that would shape a modern digital culture. Randy’s experiences here facilitated his passion to help develop legislation in favor of building the technological and digital capacity to improve society. As a CHCI Law Graduate Fellow, Randy seeks to build on his background in history, law, society, and the Internet, in order to write policies informed by the negative technological implications of the past in order to promote a progressive and sustainable future for all Americans. He is grateful for the opportunity and will immerse himself in the everyday tasks of our present day lawmakers in hopes of one day becoming a legislator himself.